At WorldViz, we’re deeply involved in VR for training. We want to highlight the work of one of our partners working on training solutions: VRIST (Virtual Reality Interpersonal Training). VRIST creates VR tools for “soft-skills” training with the help of WorldViz software. This guest post from VRIST lets them describe two of their new products and why they think VR is poised to transform this space. Do you want your collaborators, managers and leaders to be more persuasive? To give off a better first impression? To be more convincing or impactful in social interactions? To be less stressed in social evaluation situations? To handle difficult social interactions with serenity? To communicate more efficiently? If so, it’s time to consider Virtual Reality for training. VR provides life-like environments for people to practice a wide variety of interpersonal skills. There’s been a lot of attention recently on “hard-skills” VR training such as manufacturing procedures or equipment repair, but we think VR is poised to transform “soft-skills” training as well. Traditionally, interpersonal skills training involves role-play with other people. VRIST offers a completely new way of training in which the training partners are virtual humans who are always available, non-judgmental, and patient even if you repeat practice trials many times. You train in immersive virtual worlds that we’ve created with the aid of Vizard from WorldViz. A few quick words about our company: all VRIST trainings and computer programs are based on scientific evidence and on over 15 years of experience and expertise in the use of immersive virtual reality for the simulation of social interactions. VRIST is actually a spin-off company of the University of Lausanne in Switzerland. We offer software applications for job interview training and for public speaking training, as well as custom-made solutions for interpersonal skills training (e.g., train salespeople to react to difficult clients, train managers how to provide negative performance feedback) to companies, organizations, and individuals. We also conduct workshops on interpersonal skills training using immersive virtual reality. Two of our main products are the VRIST Job Interview Training and the VRIST Public Speaking Training, which we’ll introduce here. Are you an outplacement company or do you do consulting work that involves preparing your clients for their next job interview? Are you a university or school that wants to give your students a head start after graduation by offering them job interview training? If you do job interview role-play with your clients, we have the add-on that will save you time and will propel your client’s progress: VRIST Job Interview Training. The program enables your clients to prepare and train for a job interview in a virtual environment in a completely autonomous way. It also provides you with video footage of the client in a job interview situation which you can use for consulting the client. How does it work? When using Job Interview Training, your clients sit in front of a computer, face to face with a virtual recruiter. They train to answer the interview questions that are most relevant for them. Your client can choose among different job interview questions for training. The virtual recruiter asks the chosen question to which the client responds directly. The client is filmed by the webcam of the computer while providing the answer to the interview question. The videos of the answers are then available on the desktop of the computer in a folder with the name of the client. They can be used to advice your client in a subsequent meeting. Your clients can train to respond to the interview questions as many times as they wish and they can also simulate a short job interview in which several questions follow each other. Are you a trainer or consultant providing public speaking training? Are you involved in training and consulting performing artists, politicians, managers, or teachers? If you do public speaking trainings and workshops, we have the add-on that will make your training even more efficient and successful: VRIST Public Speaking Training. The program enables you to put your clients in an immersive virtual environment in which they can move around and practice their speech. 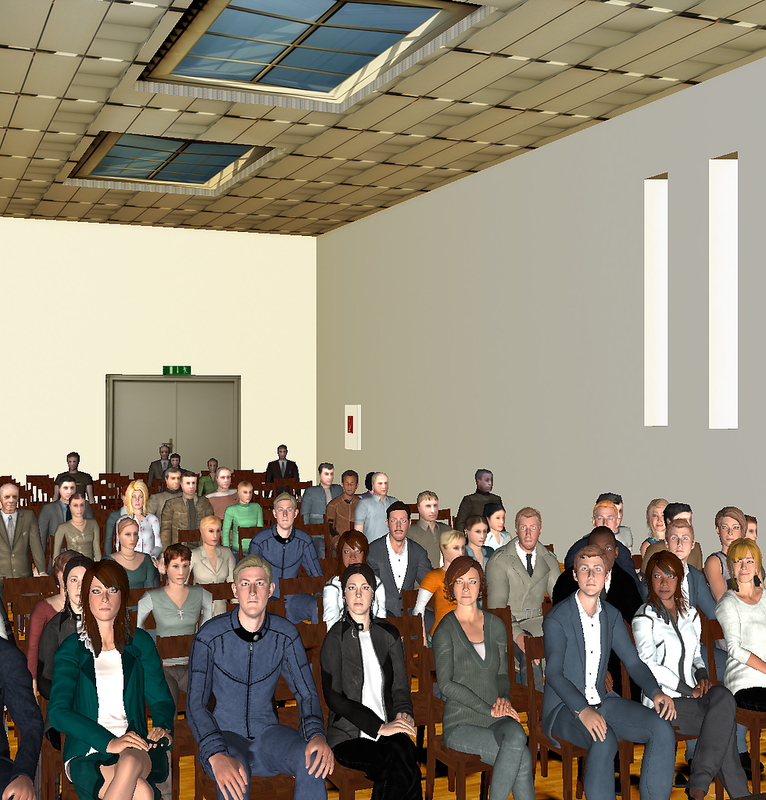 Depending on the quality of the performance of your client, you can make the virtual audience react (e.g., people leave the room; they start chatting, look away, or start to write on their computers). To increase the stress level and train your clients to manage the stress that often accompanies public speaking, you can put them in a situation where stand on the verge of a (virtual) precipice while giving their speech to the virtual public. This scenario, while you might not expect it, helps trainees liberate some of the behaviors that are important for charismatic speaking (e.g., louder voice, more gestures). We also offer workshops for companies to train their collaborators on becoming more charismatic and persuasive in their public presentations. These workshops use our VRIST Public Speaking Training. To learn more about what we do, check us out: www.virst.ch or contact us at info@vrist.ch. We’ve worked with WorldViz and their products for over 15 years in research and we continue to use their products and expertise for VRIST. WorldViz has great products, but we’ve been really impressed by the team at WorldViz and how helpful they’ve been. We look forward to continuing to work with WorldViz and their software to create VRIST products.